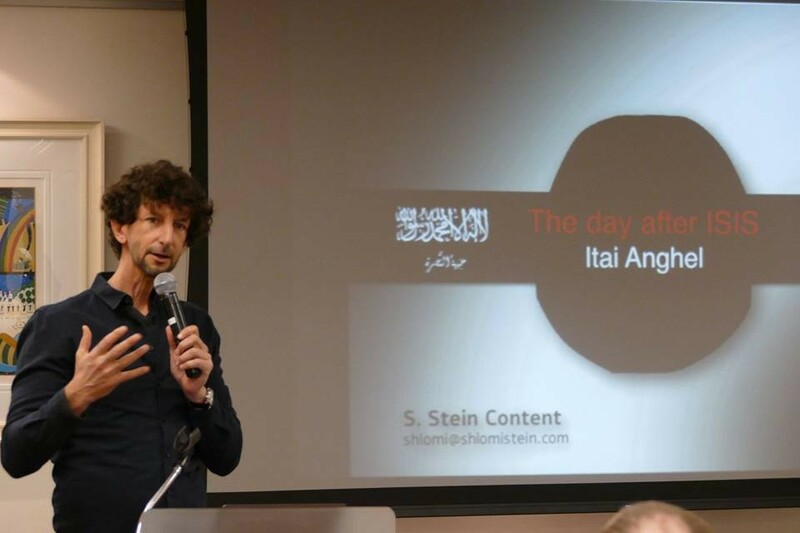 On April 3, over 90 community members gathered to hear renowned Israeli war correspondent and documentarian, Itai Anghel. Itai has been in Ann Arbor during the academic year as part of the prestigious Knight-Wallace Fellowship program at the University of Michigan. During the lecture, “ISIS: The Day After – A Look from Within,” Itai shared footage from his reporting from Iraq and Syria where ISIS has spent years forcing their extreme radical Islam on civilian populations in horrific ways and attempting to form an Islamic caliphate to rule the Middle East. Having spent time among former Iraqi Baathist soldiers and interviewing captured ISIS fighters, he provided important context to understand the rise of ISIS and how US actions inadvertently helped contribute to its success. Today, due to the joint international effort to defeat the organization, the Islamic State is battling for its survival, but its jihadist ideology remains. In the meantime, on the ruins of the Islamic State, an unprecedented Shia crescent makes Iran the dominant force in Syria, Iraq and South Lebanon. Itai’s lecture was coordinated by the Jewish Federation and Ann Arbor JCC.